You’ll find delicious Easter gifts for every bunny in our 2019 Thorntons Easter sale. We have a fantastic range of Easter gift offers to choose from! You’ll find delicious Easter eggs for every bunny in our 2019 Thorntons Easter sale. We have a fantastic range of Easter egg offers in particular with lots of different types to choose from! You’ll find a delicious gift for every bunny in our 2019 Thorntons Easter sale. We have a fantastic range of Personalised Easter egg offers in particular with lots of different types to choose from! Our red-nosed reindeer is all wrapped up for the weather in his white chocolate-patterned woolly jumper. He even comes carrying a gift. 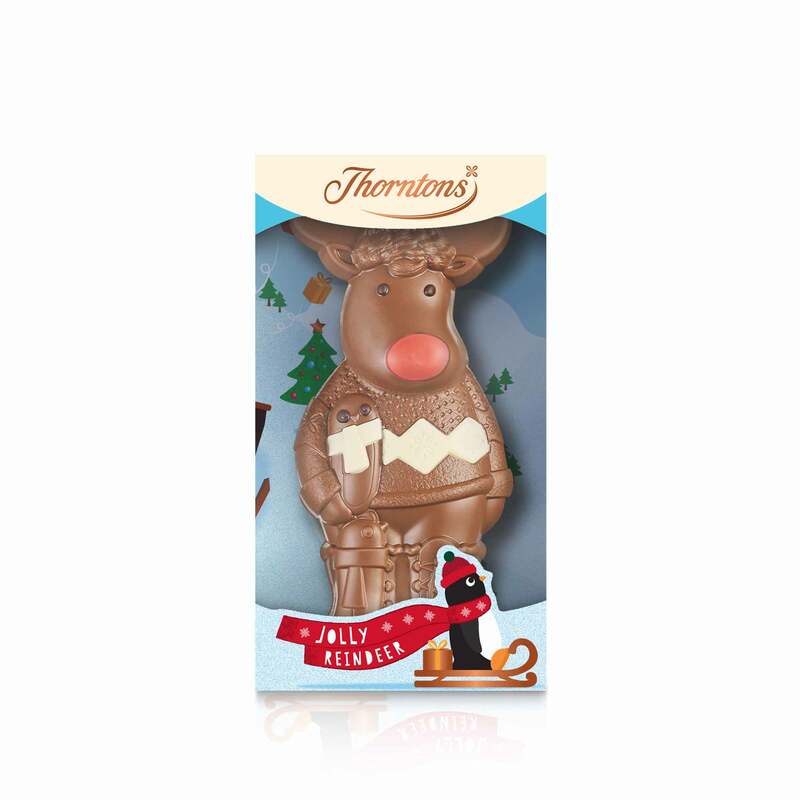 Made from finest Thorntons milk chocolate, our chunky chocolate friend is the cutest, cosiest reindeer we’ve ever seen. 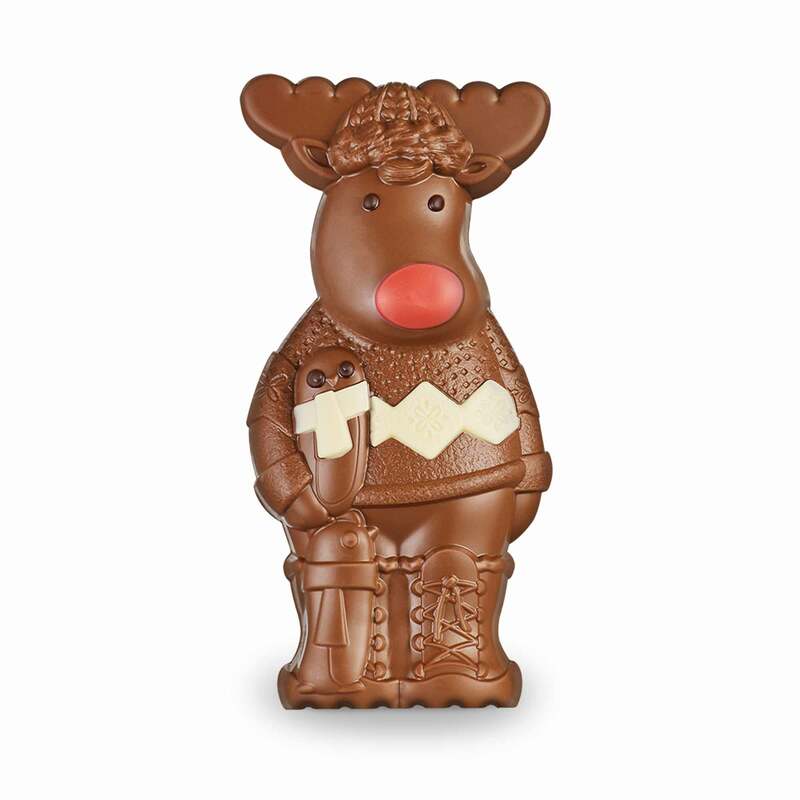 This jolly reindeer would love to join the gifts under the tree of any young chocolate fan – he can be personalised just for them too. But the big question is: will you let your little one take a bite of him before breakfast? Milk chocolate contains: cocoa solids 30% minimum, milk solids 20% minimum. Dark chocolate contains: cocoa solids 60% minimum. Sugar, dried whole MILK, cocoa butter, cocoa mass, MILK fat, emulsifier (SOYA lecithin), colours (beetroot red, paprika extract), fat reduced cocoa powder, flavouring. You're signed up to receive the latest news and offers from Thorntons. Copyright © 2019 Thorntons Ltd. All Rights Reserved. Thorntons Registered office: 889 Greenford Road, Greenford UB6 0HE. 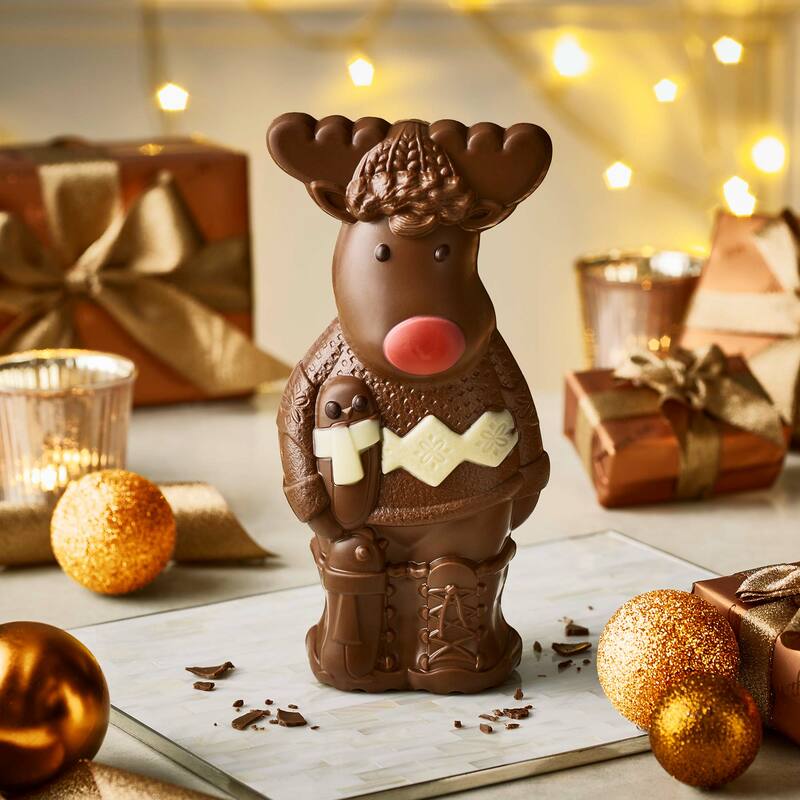 Join our community of Thorntons chocolate lovers to enjoy the latest store news, exclusive offers and delicious gift ideas. Exclusive OffersExclusive offers and new product releases straight to your inbox. Gift IdeasFind inspiration for every occasion with unique gift ideas. Local NewsHear about the latest news and events from your nearest store. © 2019 Thorntons Limited. All Rights Reserved.